Spring is here and this would look cute on your door!! View Large Image Bunny and Bear! Thimble Art 3D Pattern! Foundation Pieced.Finished size: 38" x 38" Blocks are 8" square. This pattern is a 2 for the price of 1. 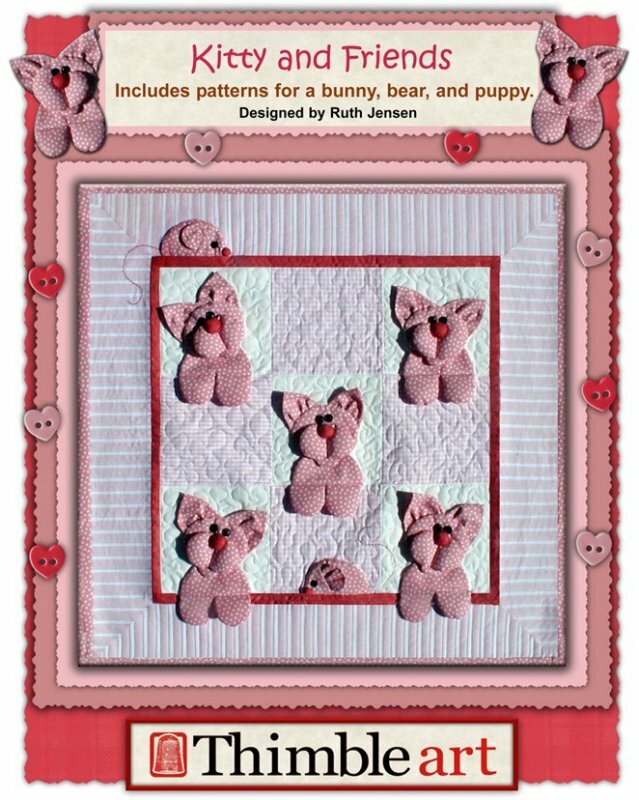 The pattern includes instructions to make a Bear quilt or a bunny quilt. Both really cute. View Large Image Butterfly Kisses! Thimble Art 3-D Pattern! 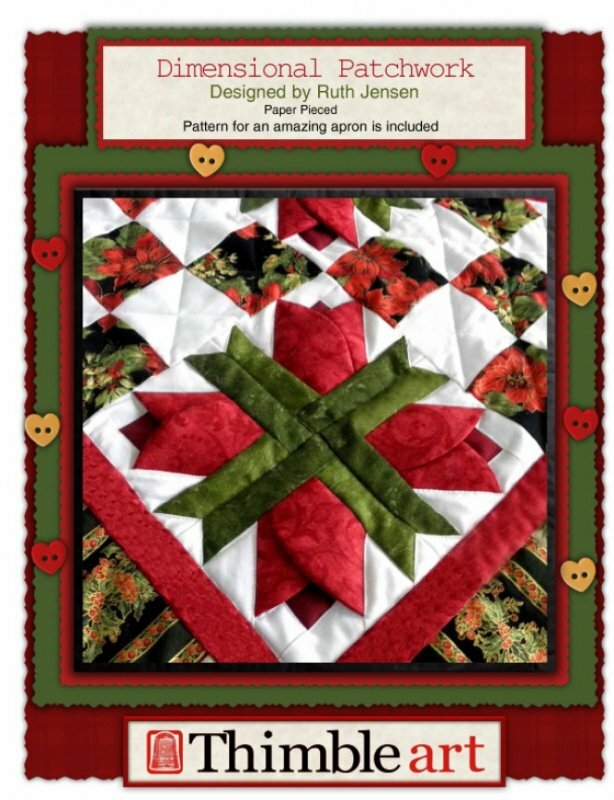 Foundation Pieced.This pattern includes instructions on sizing the blocks to make different size quilts. View Large Image Daffodils and Friends! 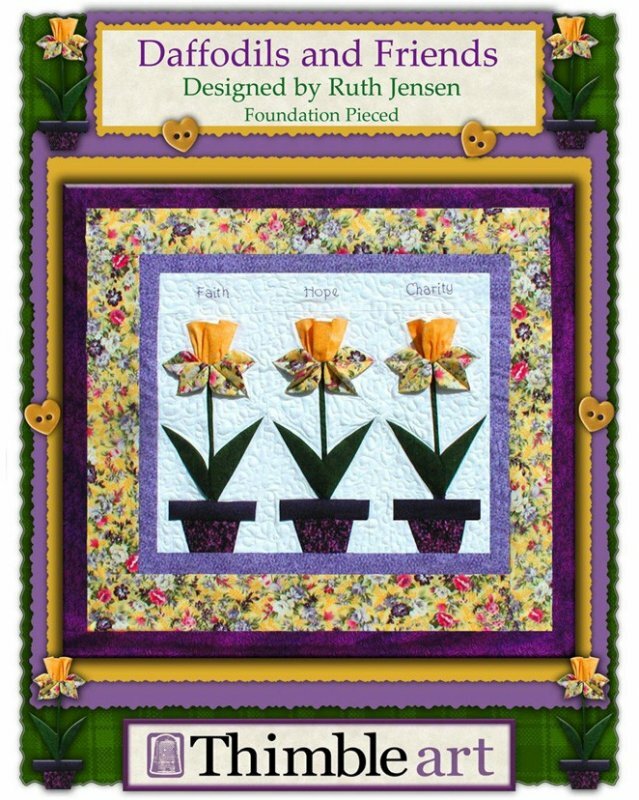 Pattern includes instructions to make 3 other flowers: Tulip, Iris, and daisy. 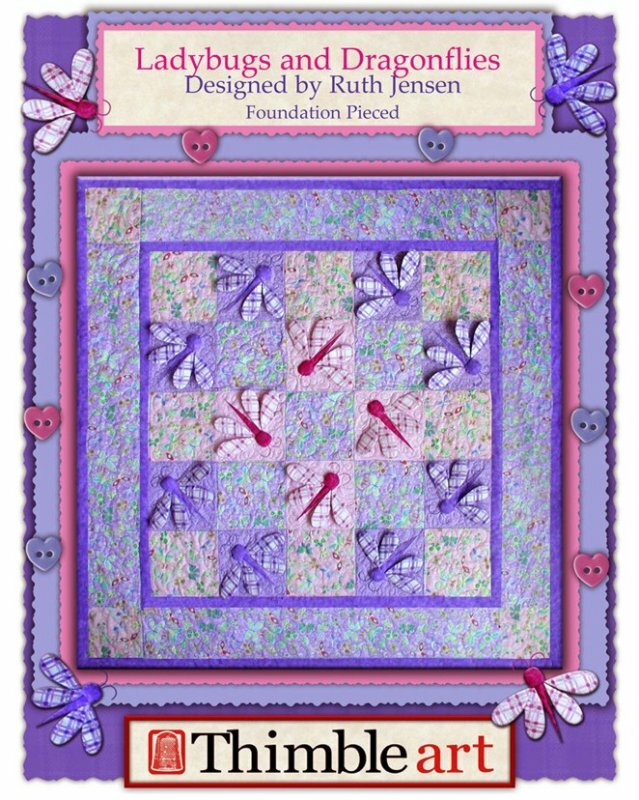 Wall hanging finished size: 21" x 24" Flower blocks 12" x 6"
View Large Image Dimentional Patchwork! Foundation Pieced. 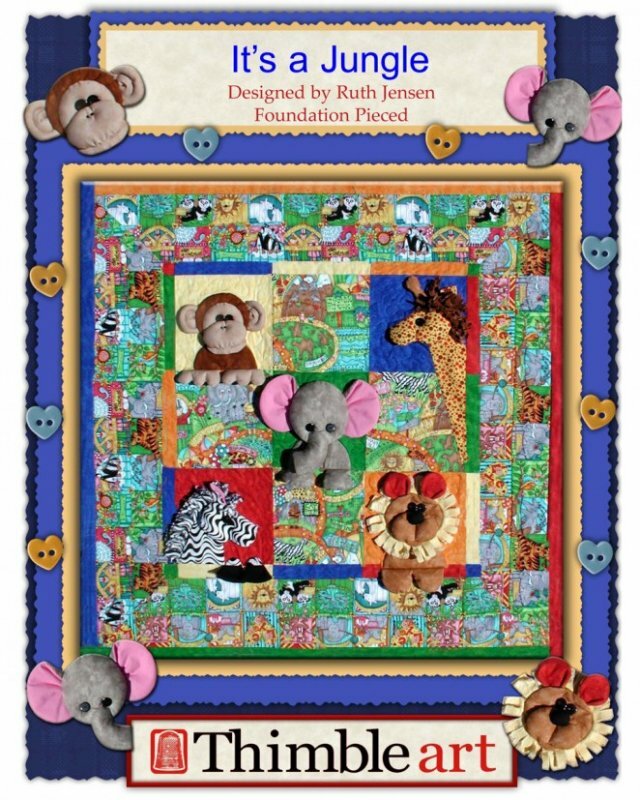 Finished size for baby blanket: 40" x 40" Finished size for wall hanging: 30: x 30"
New!! 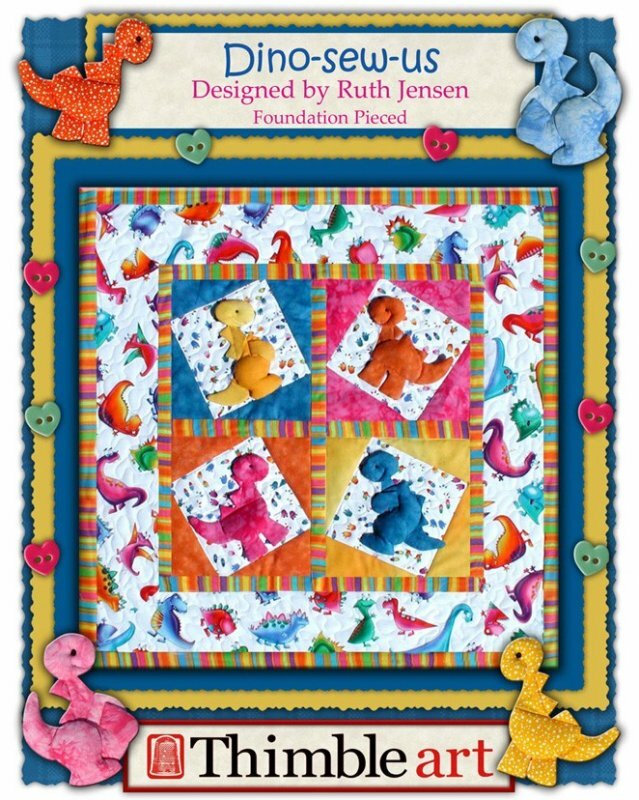 Design by Ruth Jensen!! How Cute is this? Dragon Buddies is a 3-D design. Finished size is 35" x 45". View Large Image Farm Fun! Thimble Art 3D Pattern. Foundation Pieced. Finished size: 45" x 45". View Large Image Frog Pockets! 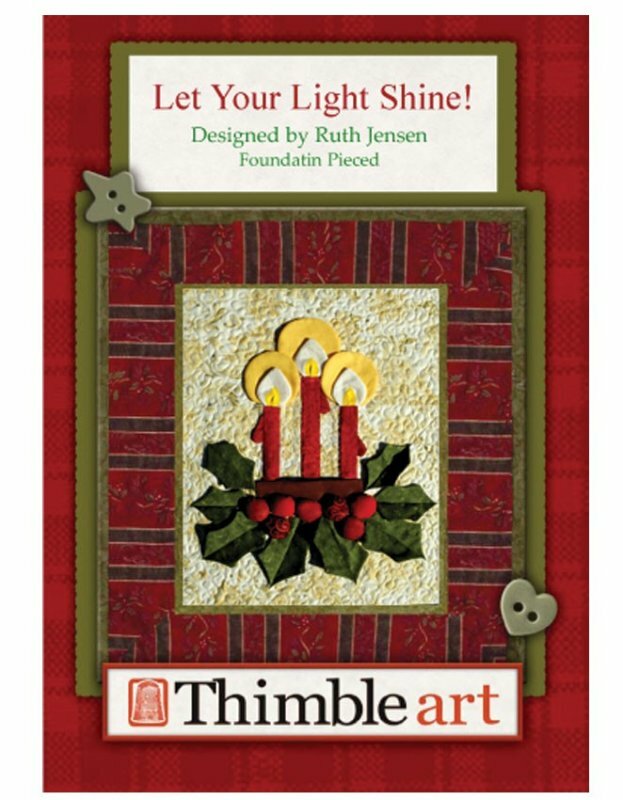 Thimble Art 3D Pattern! Foundation Pieced. Finished size: 28" x 28" This pattern is so cute. 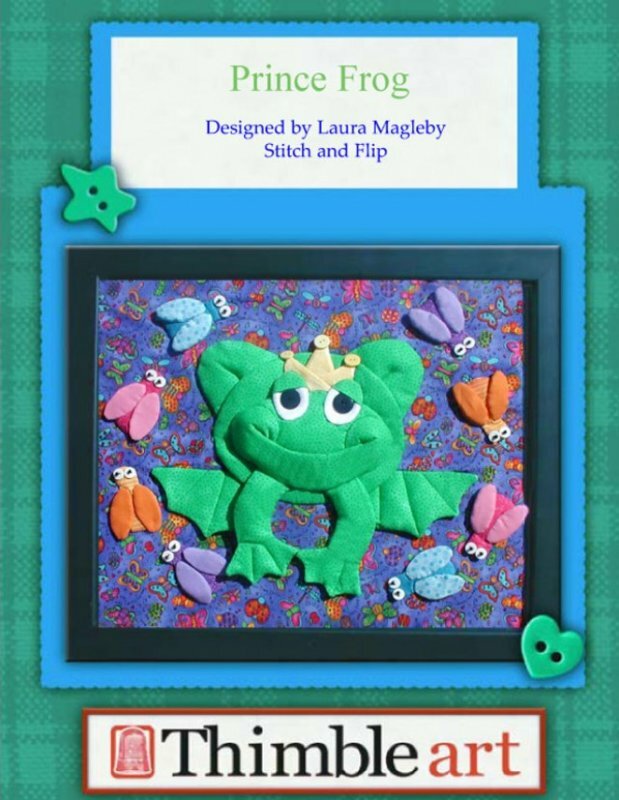 At the shop we made one of the frogs into a pillow for a Frog Tooth Fairy Pillow. Gather Your Family! 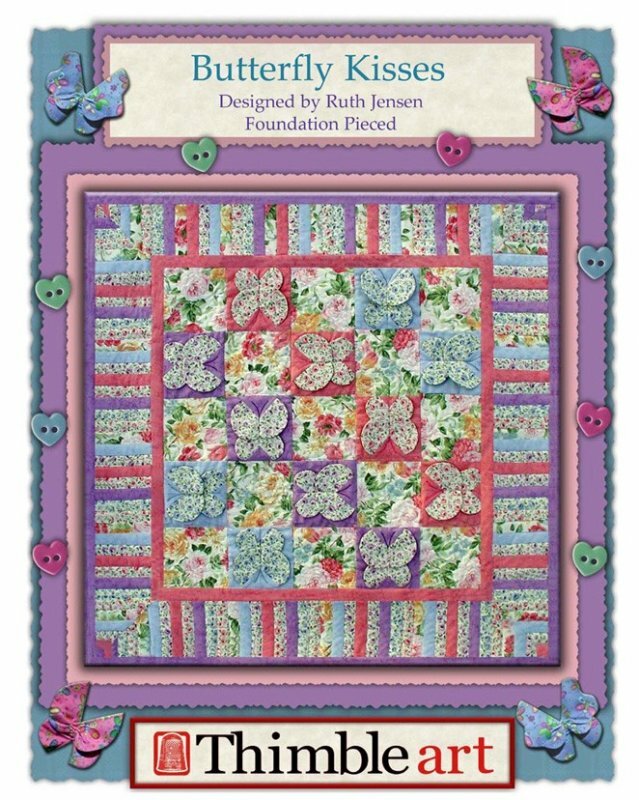 3-D Foundation pieced pattern. 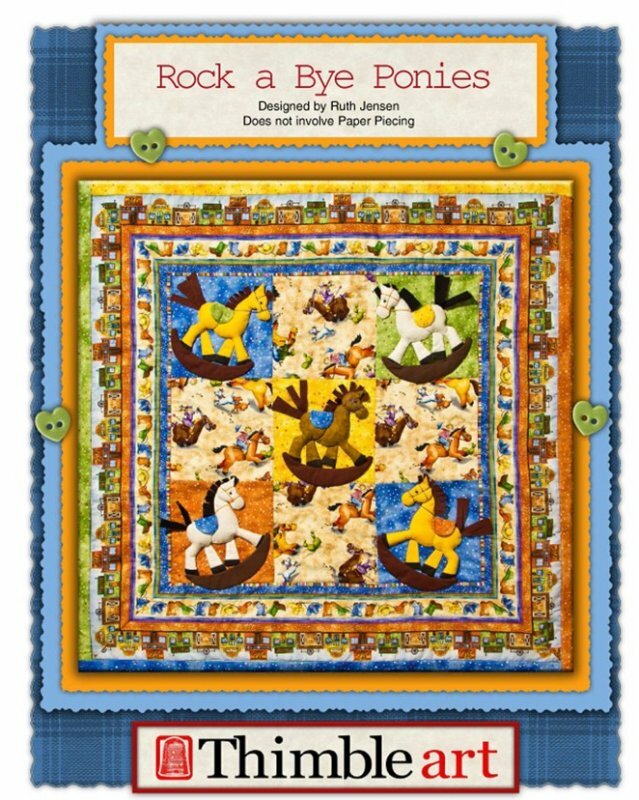 This cute wall Hanging measures 22" x 25" when completed. Finished size 38" x 38". View Large Image Just Ducky! Thimble Art 3D Pattern! 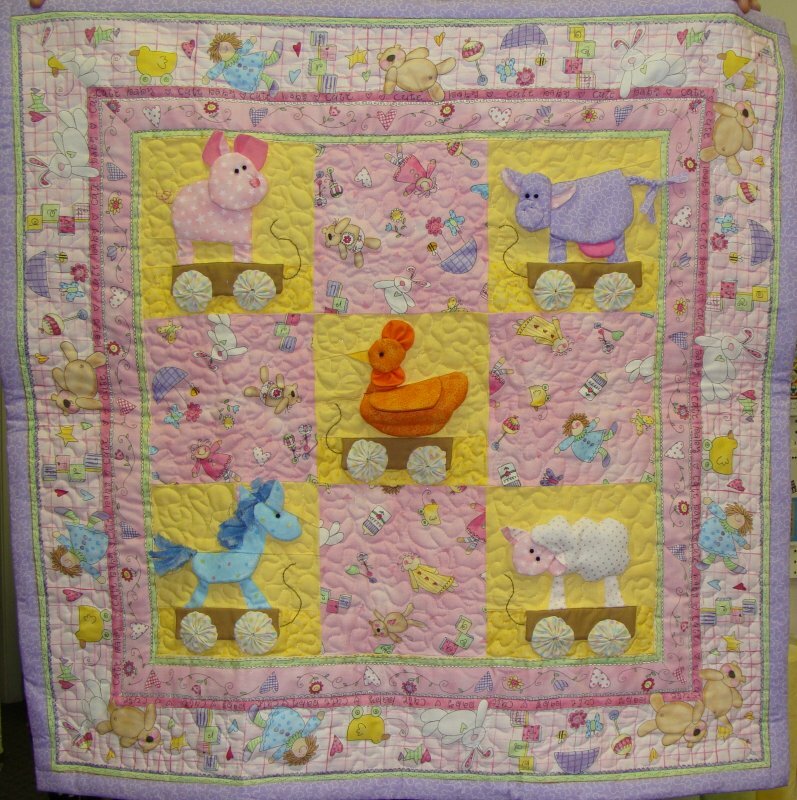 Finished size: 40" x 40" Baby Ducks Are 7" blocks. 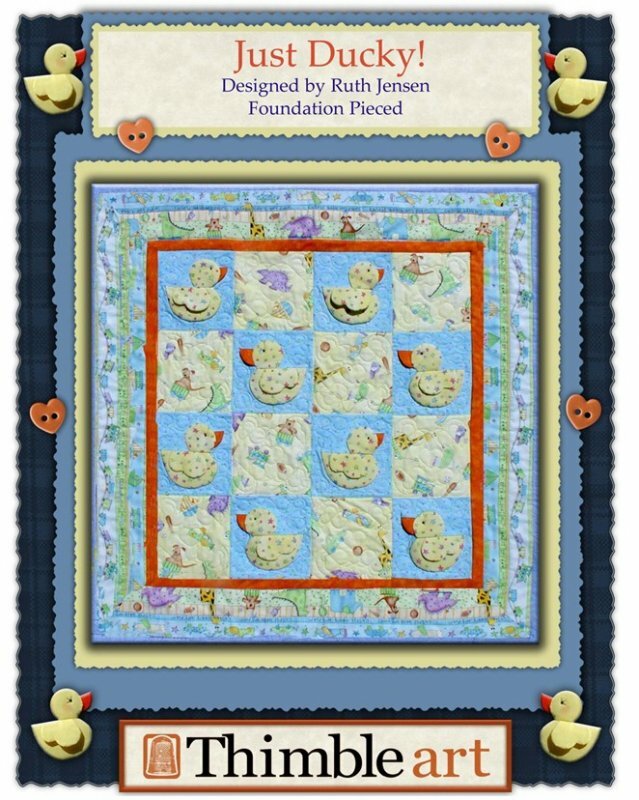 The pattern also includes instructions to make a Three Baby Ducks and Mom Wall hanging. View Large Image Kitty and Friends! 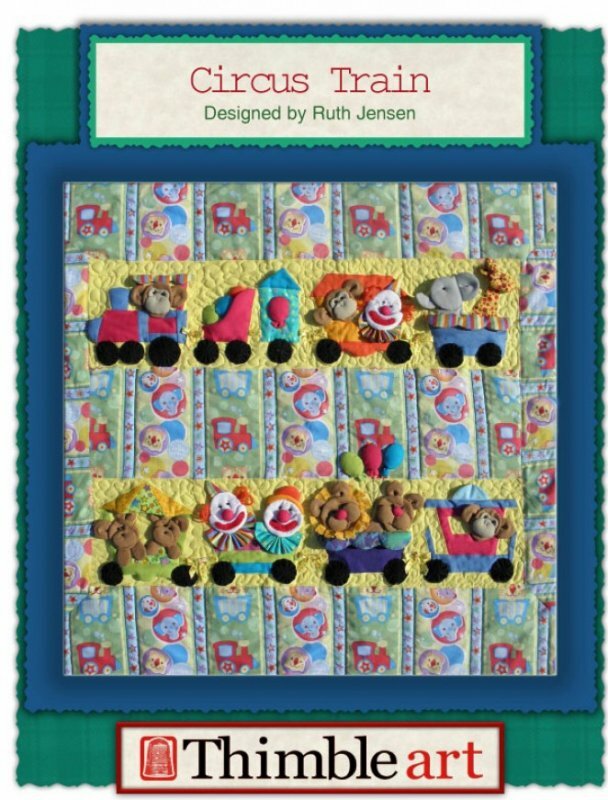 Includes patterns for a bunny, bear, and puppy version. Finished size: 38" x 38"
Thimble Art 3-D Pattern.Foundation Pieced. Another 2 for the price of 1 pattern. 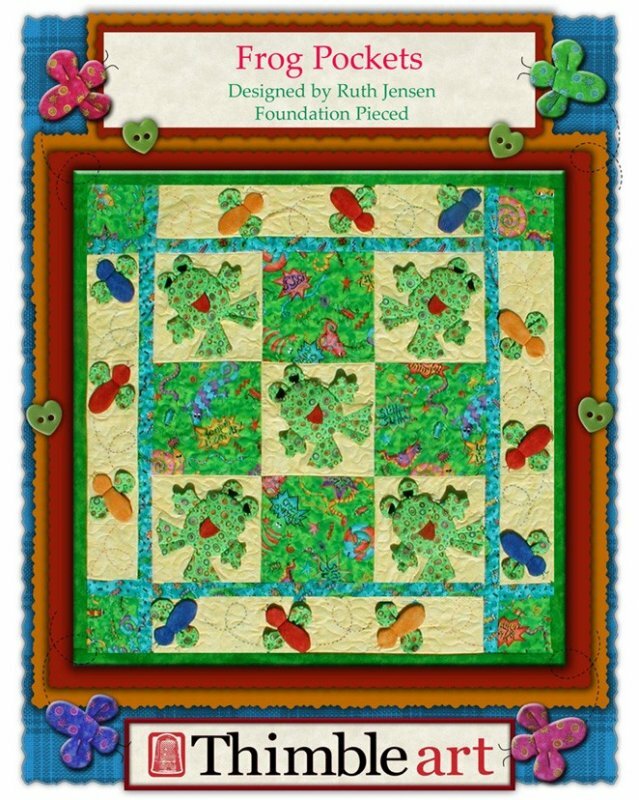 The patten includes instructions to make a ladybug quilt or a dragonfly. Oh, So Cute!! There is a sample hanging in our store. View Large Image Let Your Light Shine! Thimble Art 3D Pattern! Foundation Pieced. 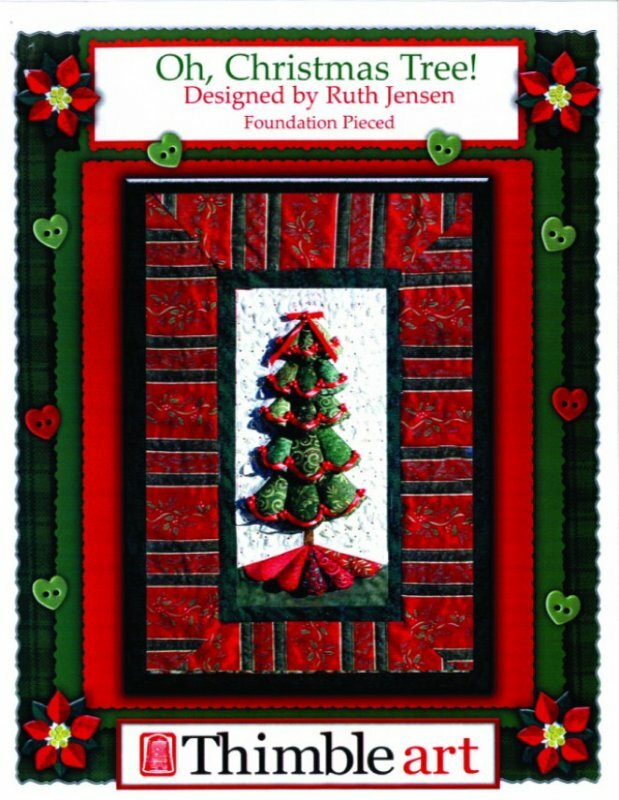 Finished size: 21" x 25"
View Large Image Oh Christmas Tree! 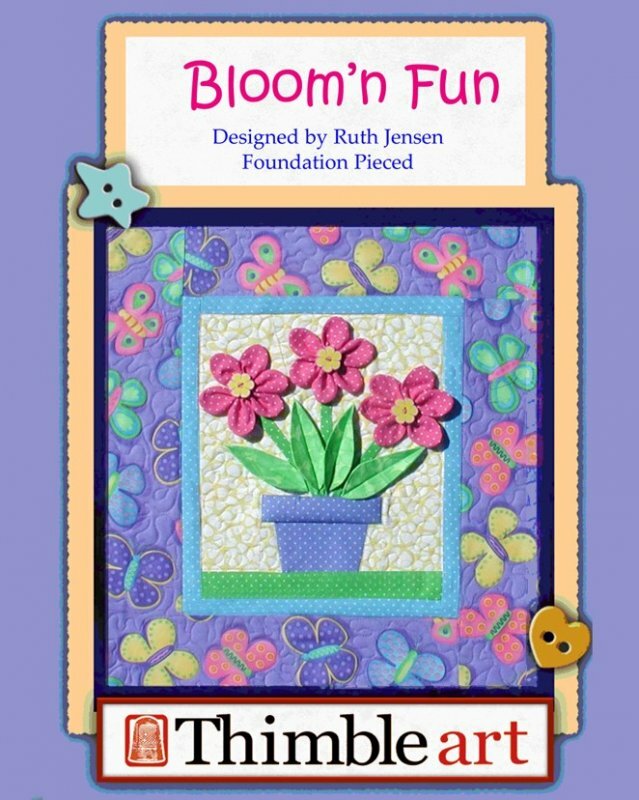 Thimble Art 3D Pattern Foundation Pieced. Finished size: 16" x 24"
View Large Image Ole' McDonald's Toys! 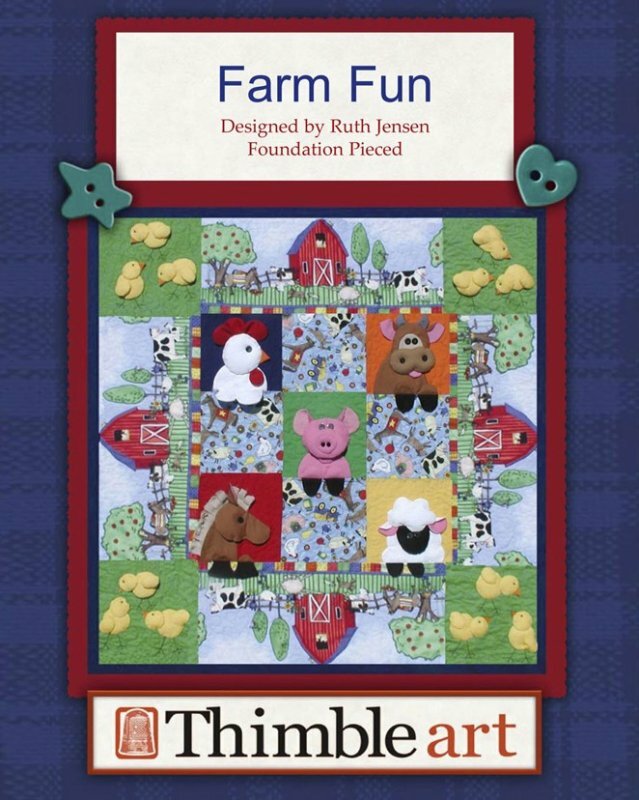 Includes patterns for a chicken, pony, cow, pig and lamb. Foundation pieced. Finished size 32" x 32"
View Large Image Plane Crazy! 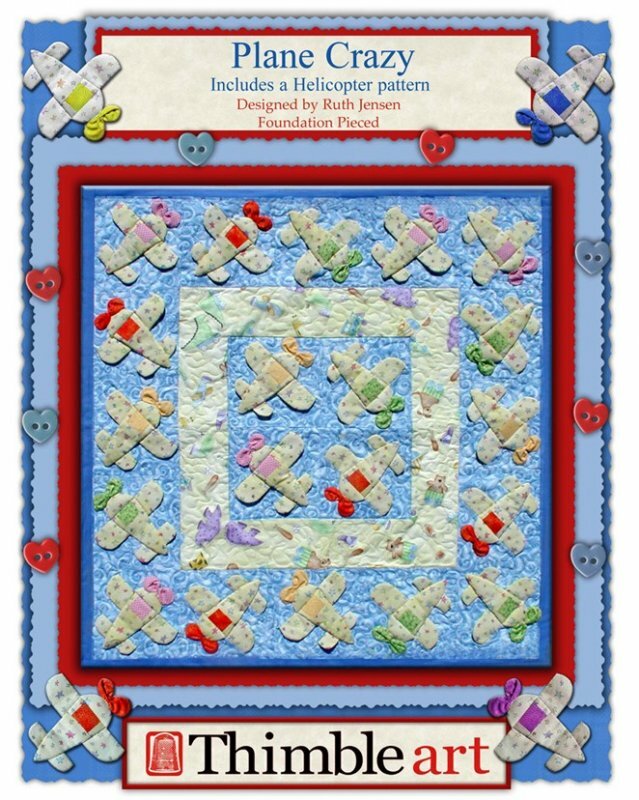 Includes instructions for a helicopter pattern. Finished size for airplane quilt: 36" x 36" Finished size for helicopter quilt: 36" x 36"
Thimble Art 3-D Pattern. 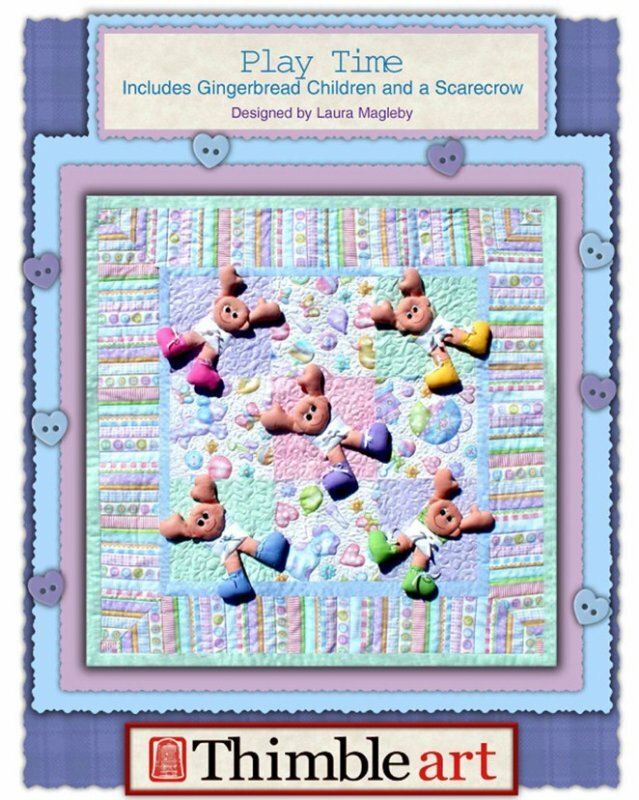 Finished Size:33" x 33" Pattern also includes instructions to make Gingerbread Children and a Scarecrow. 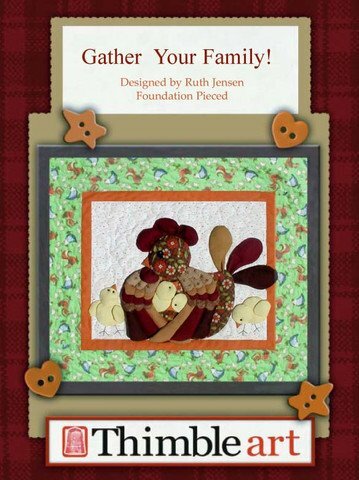 Thimble Art 3D Pattern foundation pieced. 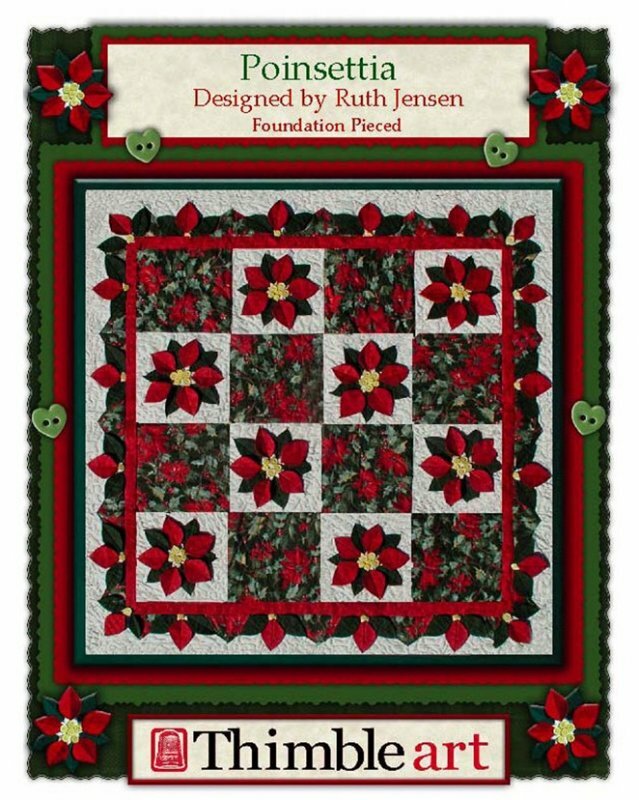 Finished size: 40" x 40" Pattern also includes instruction to make a Wreath Quilt. View Large Image Prince Frog! Thimble Art 3D Pattern. Stitch and Flip method. 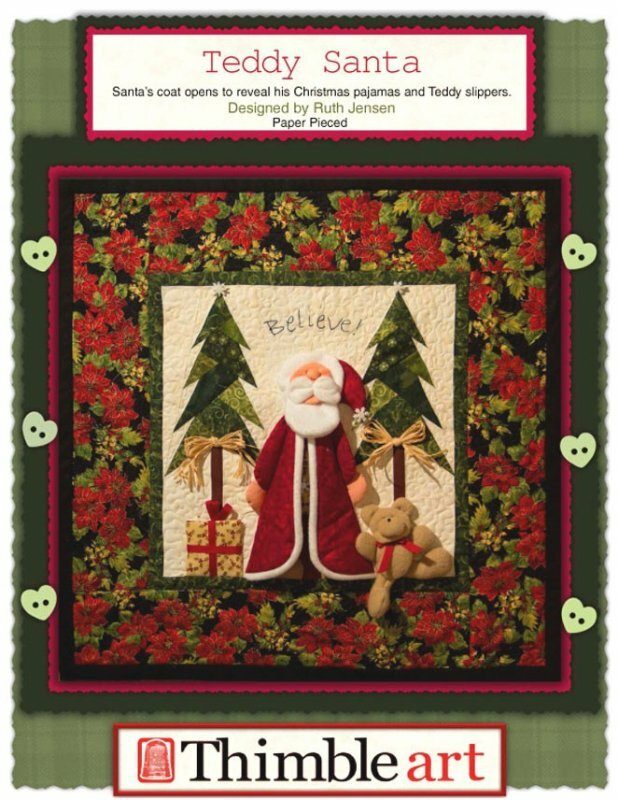 This pattern includes instructions to make a large Wall hanging 16" x 20" or a small one 11" x 14". 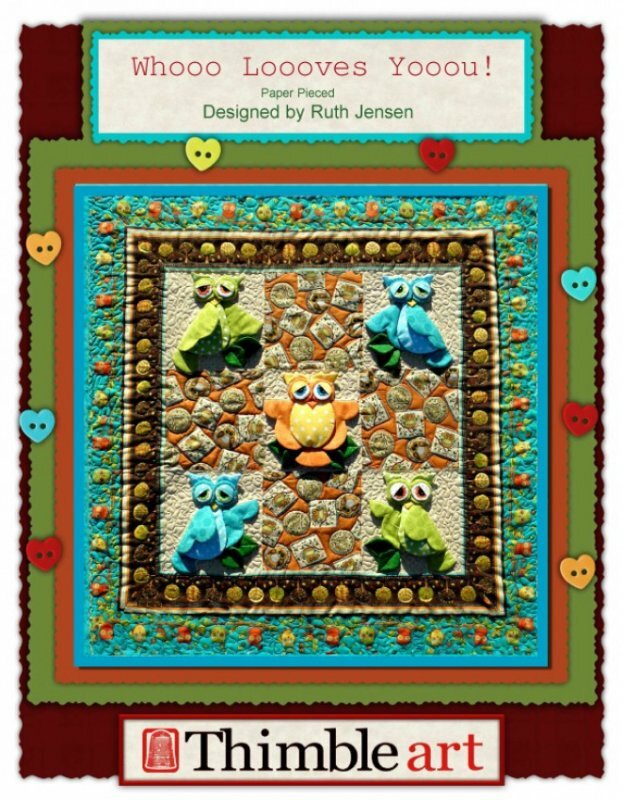 We also made a pillow out of the Large Frog and it is displayed in our store. Really, really cute. 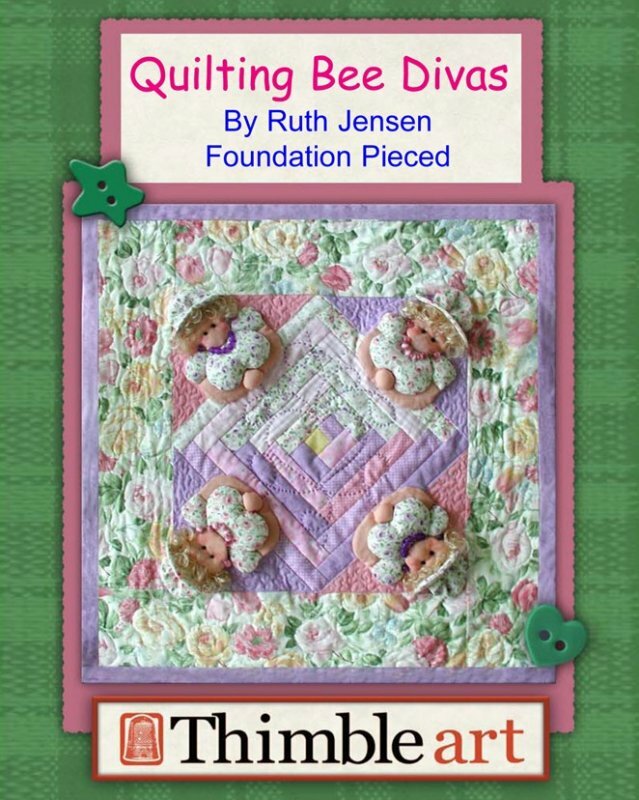 View Large Image Quilting Divas! Thimble Art 3-D Pattern. Foundation Pieced. 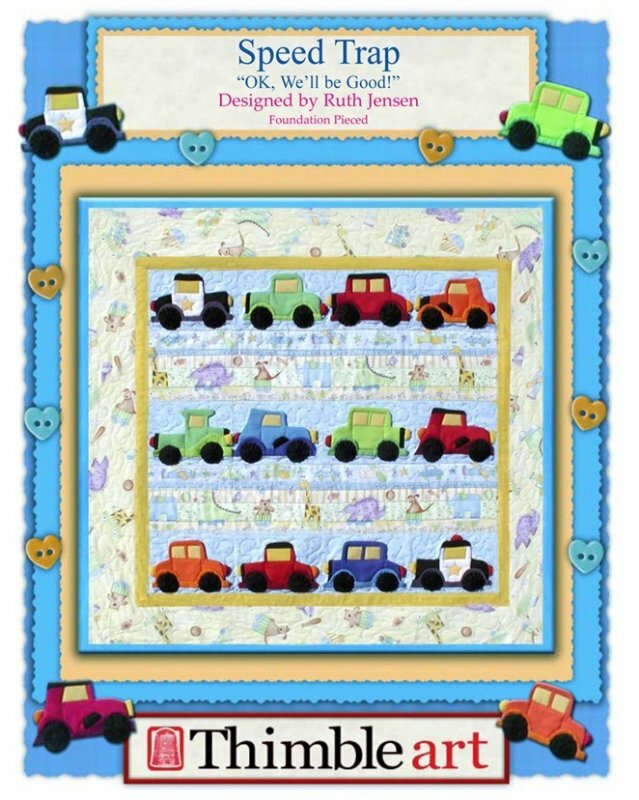 Finished size: 23" x 23" This would look great in your sewing room or hanging in your small group meeting room. View Large Image Rock A Bye Ponies! Thimble Art 3D Pattern! 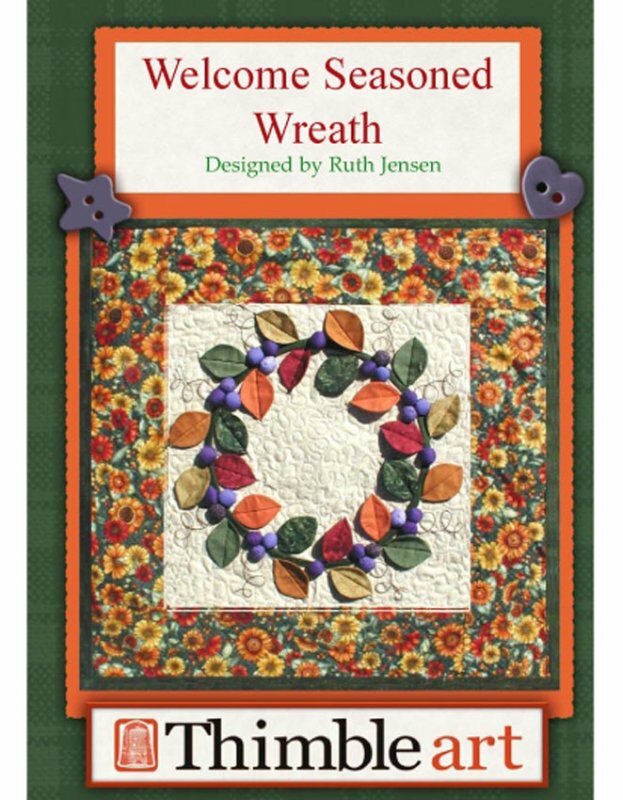 This pattern does not involve paper piecing. Finished size:36" x 36"
Finished size 36" x 36". Would look really cute in a little boy's room. View Large Image Teddy Santa! Thimble Art 3D Pattern! Paper Pieced. Santa's coat opens to reveal his Christmas pajamas and teddy slippers. Finished size: 18" x 18"
View Large Image The Birds and the Bees! 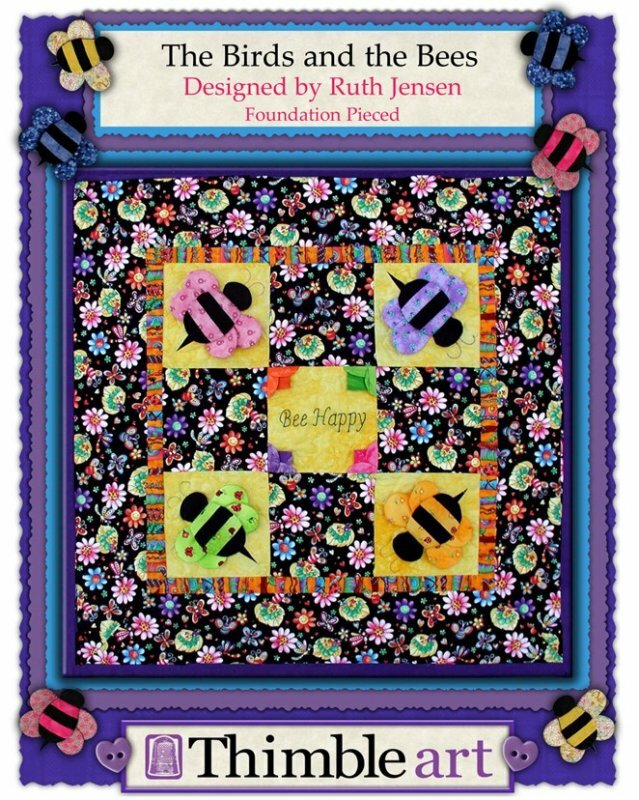 The blocks in this quilt are 6" square. 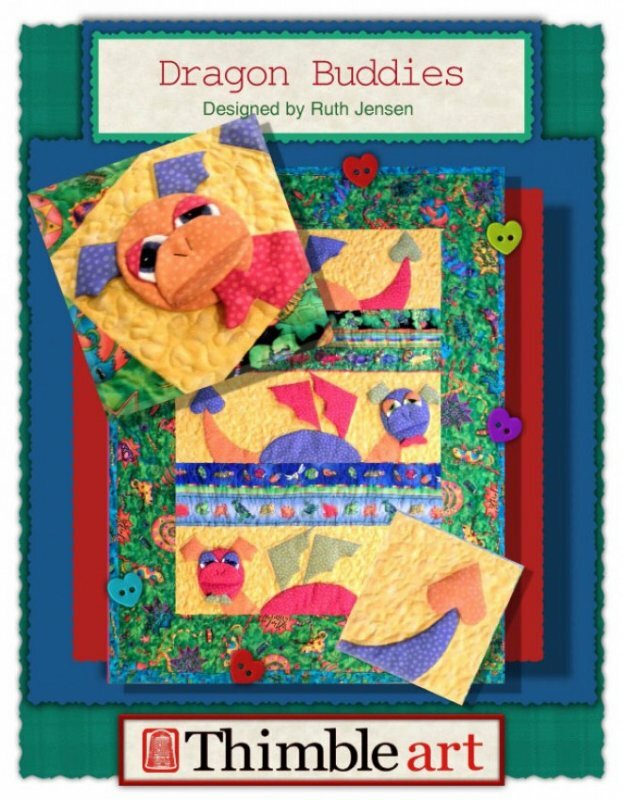 The pattern also includes instructions to make birds. This is a new design by Thimbleart. It is really cute. 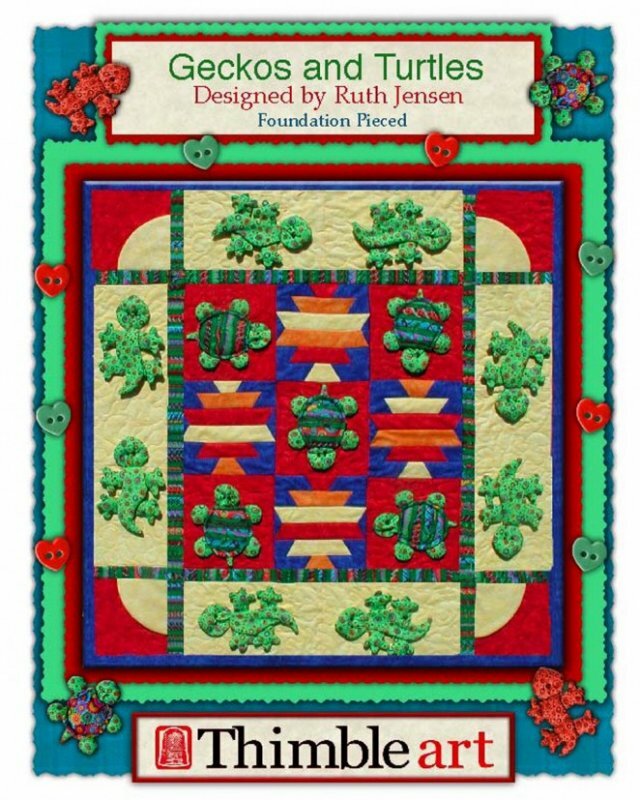 The detail really makes the quilt. View Large Image Tulip Kisses!! Blocks are 10" squares. 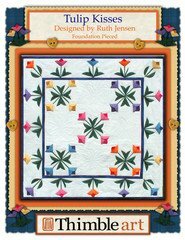 Pattern includes instructions to make the tulip kisses quilt top and also includes a Daffodil version. View Large Image Whooo Loooves Yooou! New! 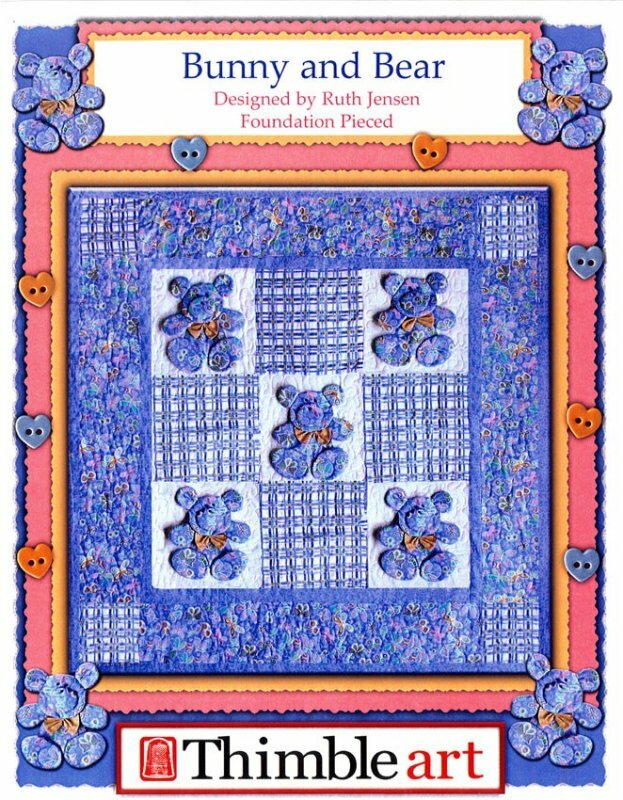 3-D patterns by Ruth Jensen! Owls are the craze this year! This 3-D project finished measures 40" x 40". Isn't this a HOOOOOOT!